Our team of flooring fitters have been extremely busy in recent weeks, clocking up the miles travelling to a variety of different sites throughout the county. Last week, we completed a fairly big project we had been working on in the Broadland Business Park. The job saw us laying flooring in a new office for Morgan Sindall’s new Thorpe St Andrew office. The pictures and captions below follow us through the job and give more details about the work we did. The office has lots of floor space. The constant use made choosing durable flooring a big consideration. The office would be home to a large workforce and would have people constantly moving between offices. For this reason, the owners chose dark carpets for the walkways. Here you can see the two different carpet tiles we used in the office. The dark walkway carpet was used to link the different offices to the kitchen area. We laid Karndean’s vinyl floor tiles in the kitchen area. Vinyl floor tiles were chosen because they are extremely hardwearing. Karndean’s range of vinyl floor tiles comes in a wide range of different colours. The colour used in this job is called Opus. 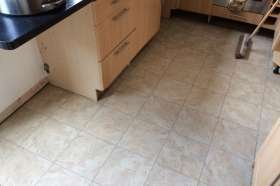 The kitchen space covered a large area and because it is likely to have food and drink spilt on it, the Karndean flooring was a good choice as it is easy to clean. It also comes with a 15-year guarantee, protecting the flooring for years to come. We’d like to say thanks to overseers Morgan Sindall for inviting us to add our expertise to the project. We have actually worked with them before, when they awarded us with two Perfect Delivery certificates back in 2017 after recognising our hard work on some of our large commercial jobs. Interested in having new flooring fitted in your office? We can help, call us on 01603 879359 or email us on sales@reformflooring.co.uk.